Manchester United are set to take on Everton in the Premier League game on Monday new years day, 01 January 2018 at Goddison Park. having draw three consecutive games, Manchester United can not afford to drop point against Everton or they will be pushed back to fourth place if Liverpool win their game against Burnley earlier in the day. The match will kickoff at around 17:30 uk time and BT Sports has the live coverage in the UK. IF you missed the live action, you can always tune in here for full match highlights. 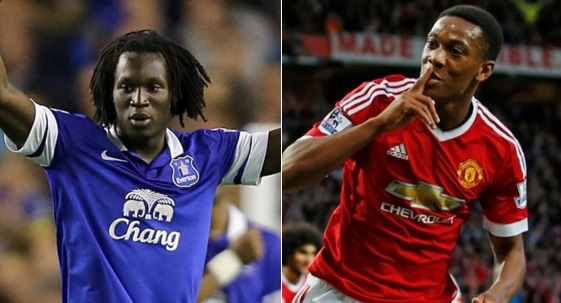 Manchester United are set to take on Everton at Goddison Park on Monday evening. A crucial game where Jose Mourinho will be hoping for the repeat of the result when these two last meet back in September at Old Trafford and United ran our comfortable winners with 4-0 scoreline. 04′ 1 – 0 Antonio Valencia scores inside first 4 minutes with an absolute peach of a goal. Manchester United vs Everton Preview: United just can not buy a win in league having draw yet another dominant performance at Old Trafford against West Brom. That was their 11th draw of the season and record 8th at home in this campaign. Mourinho will have the services of talisman Zlatan Ibrahimovic who will start upfront with Mikhitaryan, Martial and Lingard to start in attacking roles ahead of Herrera and Pogba. Everton on the other hand has enjoyed superb start to the season but lately they have been found out and struggling to score goals. Ronaldo Koeman has a decent record against United since he came to english football as Southampton manager and he will be eager to put more misery on United this weekend. Last time these two meet was back in December 2016 when Everton stole a point thanks to a late penalty. Both teams need a result in their persuit of European footabll and if United fail to get all three points while City and Liverpool win their respective games thats curtains for United’s top 4 finish. Manchester United took on Everton in the English FA Cup semifinal at Wembley Stadium this Saturday afternoon and it turned out a crackin game of football with United dominating the first half on every scale. The game started with both teams getting early chances but once United got hold of the game midway through the first half they always looked like scoring and finally broke the deadlock in 34th minute when Martial neat footwork done the left side byline and a squared ball was tapped home by Fellaini to put United 1-0 up. If United dominated the first half, Everton came out stronger in the second. They pressed higher up the pitch and United fail to cope with constant pressure by Everton. De Gea saved a penalty from Lakuku but Everton got themselves back on level terms soon when a deflected shot off Smalling found its way past De Gea. Both teams has already played twice in the league this season and Manchester United ran out comfortable winners in both games completing the double over Everton. In the League game at Goddison United secured a comprehansive 3-0 win while they also managed a narrow 1-0 win at Old Trafford. Louis Van Gaal is likely to keep Martial, Rashford and Rooney in the starting lineu while Juan Mata, Morgan Schneiderlin and Michael Carrick to play in central midfield roles. Antonio Valencia and Matteo Darmian set to keep their places as fullbacks with Smalling and Blind playing in central defense. Everton are boosted by the return of John Stones who will start in central defense role alongside Phil Jagialka while Bains and Cleverly set to miss out with long term injuries. 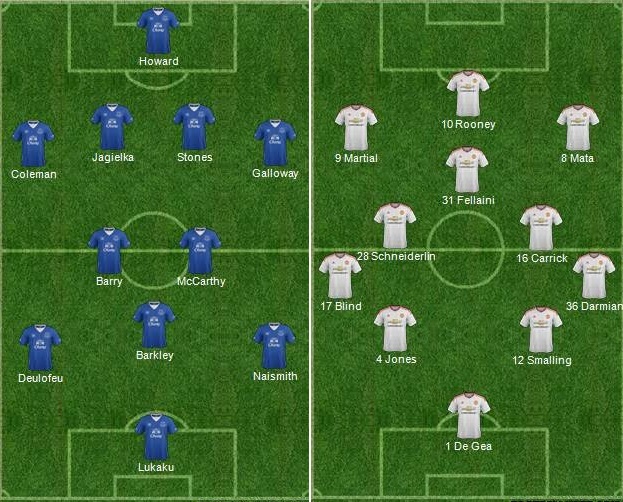 Lakuku, Steven Naismith and Ross Barkely to play in attacking roles and this is how I see both teams lining up. Match Predictions: United will be favourite for this game but Everton will be looking to bounce back from their disappointing defeat in local merseyside derby. However United has found some form and should have enough to see of the challenge from Everton on Saturday event. Both teams meet earlier in the season back in october at Goddison Park and United produced a superb display winning the game by 3-0 their biggest margin this season away from home. Everton however are a very touch team to beat when they are traveling and United’s shaky form might give some headechs to Louis Van Gaal.